A kinetic model. 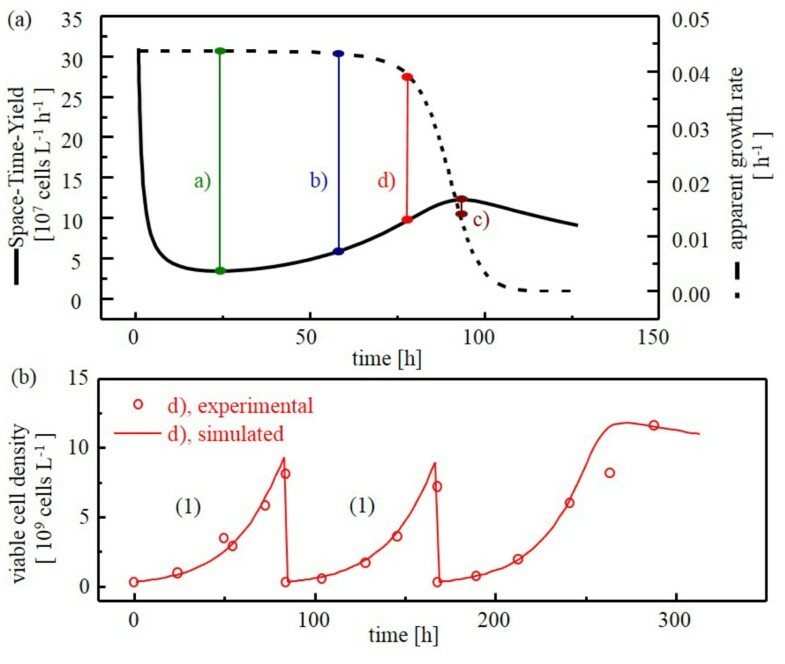 In this case a simple unstructured model where kinetic parameters can be obtained from a few experiments only. A Nelder-Mead-algorithm to determine model parameters. A developed MATLAB software tool able to determine optimal points in time or viable cell concentrations for transfer into the next scale. The successful application for the cell line (AGE1.HN AAT , ProBioGen AG) has been shown previously . Here the tool was tested for a suspendable CHO cell line. The cell line CHO-K1 has been grown in chemically defined TC-42 medium (TeutoCell AG, Bielefeld, Germany), 4 mmol L-1 glutamine. Data for parameter identification for the kinetic mode were determined in shake flask cultures. The seed train steps were: 1. culture tube (0.0025 L), 2. shake flask (0.070 L), 3: Labfors 5 Cell (2 L). For the seed train first different optimization criteria were compared in silico (Fig. 1a). Finally, the average of time at maximal space-time-yield (STY) and time at 90% of maximal growth rate (0.9·µmax) was used as optimization criterion for cell transfer. The concept was tested successfully up to a 2 L scale for 3 scale-up steps (Figure 1b). The concept offers a simple and inexpensive strategy for design of seed train scale-up steps. The results for the lab scale steps show that the tool was able to perform a seed train optimization only on the basis of two batches, the underlying model and its parameter identification. The bioreactor (Labfors 5 Cell) was kindly provided by the company Infors AG, the suspendable cell line CHO-K1 by Prof. Thomas Noll, University of Bielefeld.